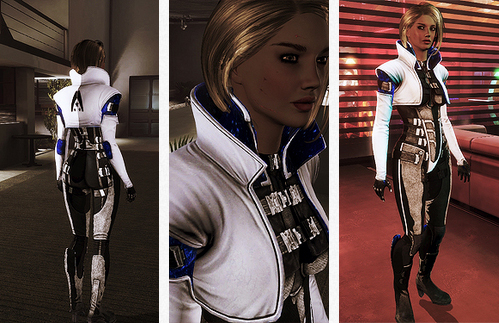 This mod is a take on Aria’s uniform. Comes in regular blue and sparkly blue versions, with and without the Alliance logo on the back. The mod requires you to use ME3Explorer to install. I modified the textures to show the skin underneath, like the original. 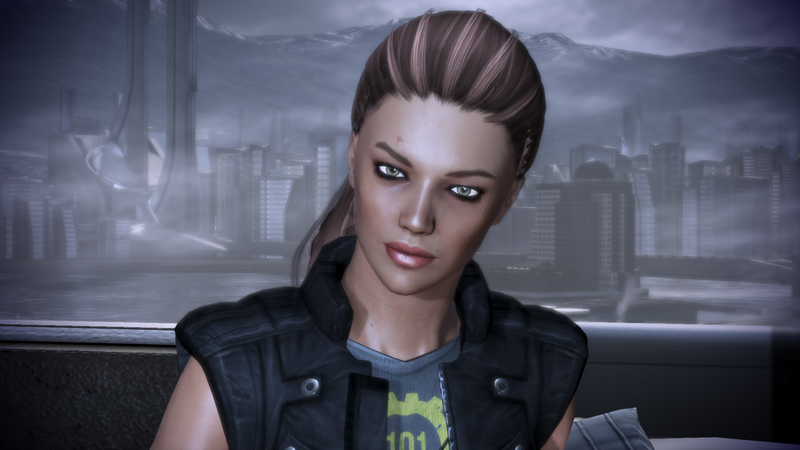 Works good with my Femshep, didn’t test it with any other skin color, but should work just fine. I have tried out your texture, it didn’t work for me. 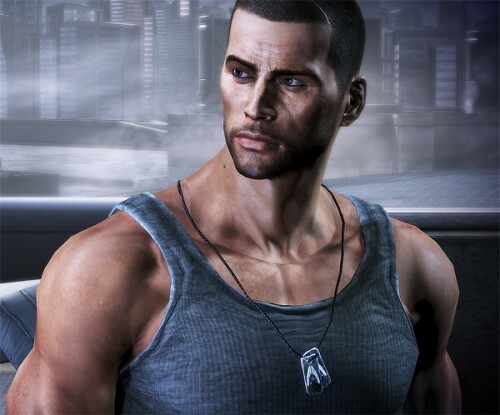 Tried to recolor the textures myself so the skin would be visible, but even though I actually managed to recreate the same pale color, it shows up as grey instead of the skintone of my Shepard. What am I doing wrong? Can you – or anyone – help me with this perhaps? Not sure when my previous message’s going to appear, but either way. 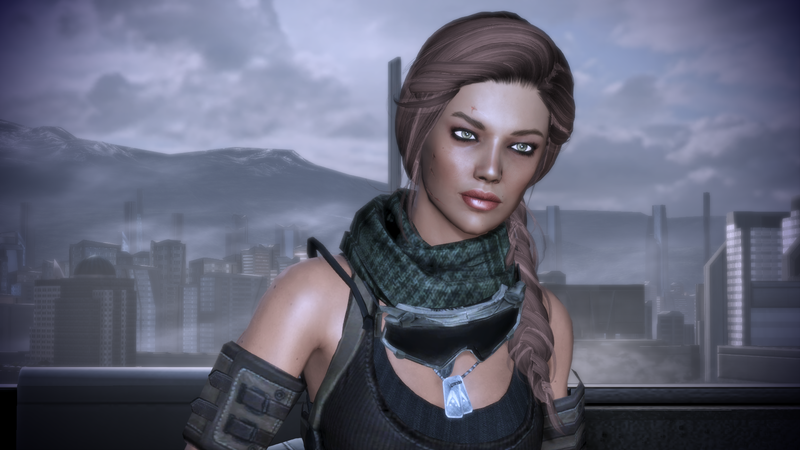 I just figured out the problem, forgot that the .tpf is probably for another mesh (I changed the intro outfit instead of the N7 dress), after doing that it was fixed for me. My question still stands, how did you do it? Because all my attempts at making the skintone blend failed, even though I took another texture as example and managed to match the color on that one. I was wondering if the problem was with that I tried to smoothen the skin on this texture so it wouldn’t be scaley, not sure. Any suggestion, help would be greatly appreciated. Amazing mod! looks wonderful… but i think i goofed! 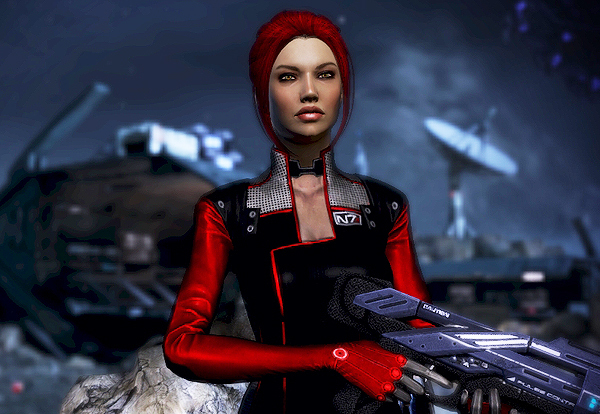 I followed your handy tutorial for meshing casual outfits, but the end result plastered the aria colors onto Shep’s black dress and she ended up looking like a smurf. So I have to ask a few questions, oh wise and mighty mod-maker! 1. can you ‘undo’ applying a mesh, or do i have to do a vanilla install? 2. Did I do something stupid to cause the black dress form remain while being colored with aria’s colors? PS: I’ve been trying to find a way to install the ‘Mother of all Mods’. You might have heard of it, or use it. Does it clash with any of your mods? And do you know where I can get the exe? I’ve searched the web and all i find are ‘core’ files, but not an exe to install it with. The mother of all mods is a coalesced edit and therefore has nothing to do with my mods :) I use the mother of all mods to unlock all the NPC outfits! :) I don’t think it comes with an exe file – I just copy the coalesced file into my folder replacing the original coalesced file. As for the 1. yes you can undo applying a mesh by copy pasting the original file back into the folder. 2. If you’re seeing Aria’s textures but still Shep’s black dress mesh, that means you didn’t apply the mesh correctly/successfully. Try again? I also need help with this one…. i tried to add this armour to terminus armor and in game it is just some weird red texture. Any idea what I did wrong, I read your tutorials and faq guide but the closed thing I could find is a green glue issue, but mine isn’t that its just the entire texture has turned red with a weird shadow look. the Exact same thing happened when I tried to apply your samara outfit onto the defender. Your casual outfits have worked fine for me though, I have the catsuit, ava, and spacecowboy installed. what am I doing wrong with the armour?